Aaron: [Sound of a phone ringing. Aaron, voiceover:] Here's what's going to happen. I'm gonna read this, and you're gonna listen, and you're gonna stay on the line. And you're not gonna interrupt, and you're not gonna speak for any reason. Some of this you know. I'm gonna start at the top of the page. Q: How did Mr. Granger know about the time machine? 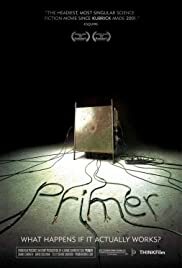 Q: Are there any online articles about PRIMER? Q: What is the conventional understanding of what occurs in the film? You remember the first time you saw The Matrix (please, not the awful sequels) and you could barely keep up with what was going on, trying to piece together the pieces of what you were being told into a coherent story? This movie was exactly like that. The first half or so is fairly linear (despite the frenzied Altman-esque style of everyone talking on top of each other), but then it gets WEIRD and it just absolutely blew me away. This film won a major Sundance award, and normally that means I won't like it (especially the normally pandering audience award winners) but this movie, and first-time filmmaker Shane Carruth, deserves absolutely everything it gets. I am just blown away. Did you like Pi? If so, go see this one. By the way, the attention to detail in the beginning is great. Often in thrillers with technical content, if you have a technical education you have consciously ignore all the stupid movie crud that they pull to make it into a good story. But this movie pulls off an incredibly believable technical story, with only a few distracting gaffs. That is, the tech jargon is good enough that you don't get distracted and can focus on the story line. Final comment: Yes, it is very hard to follow the story line in this movie. Obviously I'm not going to spoil it, but I think the following fact will help when the movie gets kind of hairy towards the end: Aaron is the dark-haired guy, Abe is the blond-haired guy. This movie now has distribution and you should keep an eye out for it in the fall. 252 of 355 people found this review helpful. Was this review helpful to you?